Lucky’s soup shop is busier than usual this October, with groups of itinerant travelers in town to work the Harvest Festival. One newcomer seems to take a particular interest in Lucky’s young waitress, Janie, spying on her from across the street. Is the stranger stalking Janie? 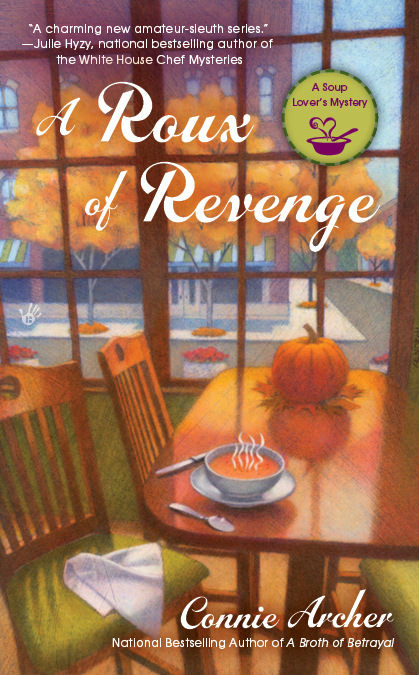 My thoughts: The soup shop in this particular series, By the Spoonful, is by far one of my most favorite locations in all of the cozy mystery series. How much cozier can one get than a nice, warm, cozy soup restaurant in a town called Snowflake, Vermont! I love it and can picture it every time I read this series. I really enjoy Connie Archer’s Soup Lover’s Mystery series. As I am sure that I have mentioned in my reviews of the first two books in the series, Spoonful of Murder and Broth of Betrayal, I truly enjoy the main character Lucky Jamieson. I love that she is a strong, empowered, female character that has definitely been through some difficult times but has come out on her feet. She is finding her way in business and in love! A truly great female lead character. As I continue to read further and further into this series, I also am enjoying really getting to know some of the other characters in town. They truly become your family which is why I love series books so much. This book started out a bit slow for me but I will see really picked up the pace as we got further and further into the story and investigation of the murder. My only issue with this series, and it really isn’t a problem with the series itself, but rather I guess where I live . . . is that the publication dates of the books in this series always come out off season. What I mean is that his particular book is set in fall around Halloween and is published in Spring (after a long, hard winter at least where I live). I know this is a crazy, stupid issue, but I want to be reading about nice, warm cozy soup on a nice, crisp, fall day in the fall not during spring. That aside, I do love this series and eagerly await book #4! Go out and start this series, you won’t regret it. Hi Heather ~ Thanks so much for your wonderful review and thanks for hosting A Roux of Revenge today! My pleasure! Looking forward to the next book in the series! Nice review! I really enjoyed this book, too, and just put the first two on hold at the library. I love your description of Lucky as a “strong, empowered” woman, though it’s clear in this book she still has some insecurities when it comes to her love life. Still, she’s smart and caring (and I love the reason for her name!) This is one of the best-written, least-cliched cozies I’ve read in a long time. Great review!! I’ll have to check this series out! Thanks for linking to the Foodies Read Challenge! I just read my first cozy mystery book and A Broth of Betrayal is going to be my second. Snowflake sounds like an interesting place. Thanks Heather.